Debbie Mancini is the ‘heart and soul’ of the company; promoting the business and scheduling all functions. She conducts the consultations, coordinates the events, and is experienced as a sound engineer as well as being comfortable as an emcee. Greg Mancini is the ‘seasoned veteran’, who has been in and around the music and entertainment all his life. His voice-overs have included television and radio commercials, corporate documentaries and promotional videos. His experience has gained him the professionalism with every facet of the business; from consultations, coordinating events to emceeing and sound producing. “Professional style and grace…” A professional emcee keeps your guests informed, announcing all events with professional style and grace, insuring the events you have selected will be properly presented. An experienced sound engineer (DJ) presents the music selected throughout the celebration and maintains a comfortable volume. Is trained to inspire guests with music to dance and enjoy the festivities late into the event. Choosing the right entertainment for your function is one of the most important decisions you have to make to ensure the success of your event. 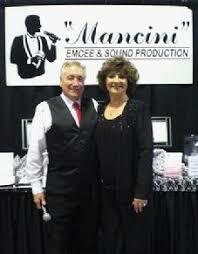 By hiring “MANCINI”, you can relax and know that your special event will be one to remember.